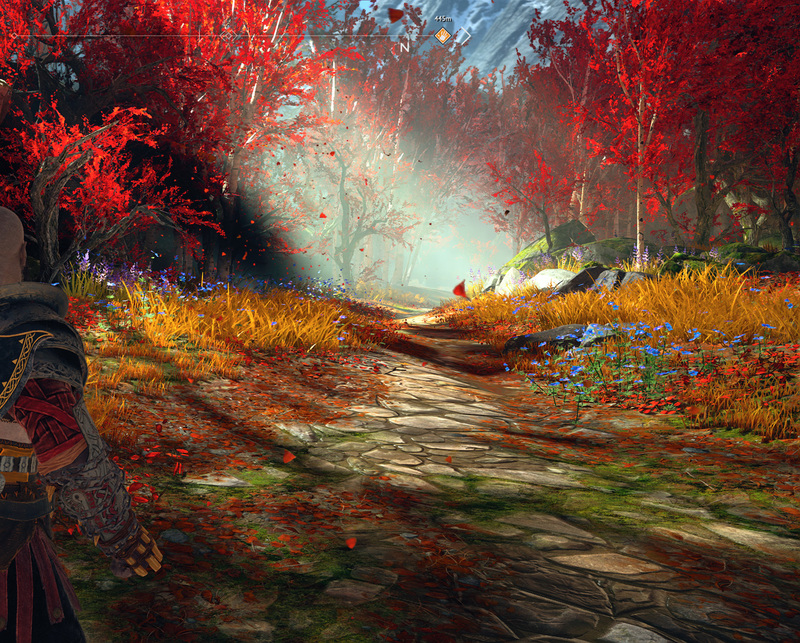 The artists at Sony Santa Monica put in the work to make God of War one of the best-looking games on PlayStation 4. So the embargo is lifted and the critical consensus is that the new God of War is pretty damned good. I wouldn't agree with some of the hyperbole calling it "the game of a generation" or anything like that, but Sony Santa Monica clearly put a great deal of craft and effort into it. The result is a game that revives the God of War name, tells an interesting tale, plays great, and looks really, really good. All screenshots are 4K JPEGs, converted from PNGs taken via the PlayStation 4 Pro's native screenshot tool. I have cut off the left third of the images to preserve spoilers. To see the PNGs, click on the links below each image. The last point there is important. With this generation of consoles, Sony's first-party studios have been working hard to outmatch each other. Infamous: Second Son from Sucker Punch came out near launch, but it was visually one of the first games that made me go, "Huh, I guess the next generation is here." The Order 1886 looked amazing, but sadly didn't play as well. Recent titles like Uncharted 4: A Thief's End, Horizon Zero Dawn, Uncharted: Lost Legacy have all proven that Sony's studios know what they're doing with the PlayStation 4 and the follow-up PlayStation 4 Pro. Which brings us to God of War, which stands as the marquee visual showcase for the PlayStation 4 Pro. Seriously, the game looks great from top to bottom, with Kratos and his son Atreus wandering across the gorgeous realms of Norse mythology. 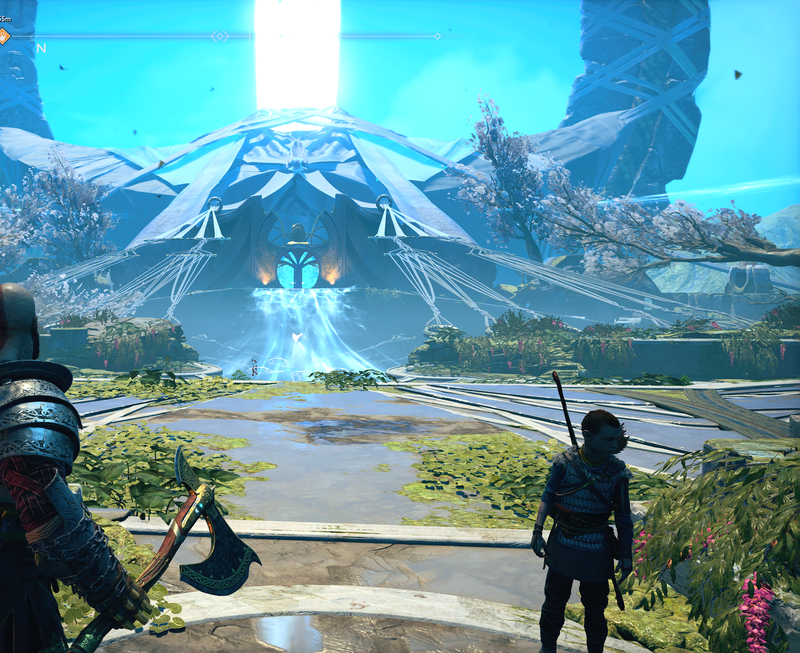 The environmental art does reuse a specific motif and design for certain sections of the adventure—for good reason—but each new region always gives players something to look at. This is also helped by God of War's ongoing committment to this idea of mythical scale: you don't always engage directly, but many of the key areas sport huge creatures in the background, like the World Serpent or other giants of days past. Let's get down to the technical details. On a basic PlayStation 4 with a 1080p television, the game runs at 1080p with a frame rate of 30 fps. If you're rocking a PlayStation 4 Pro and a 1080p television, the game uses supersampling to give you a clearer image, but you're still stuck with a frame rate of 30 fps. If you're running a 4K television, God of War is presented in a checkerboard 2160p image (4096 × 2160 pixels). 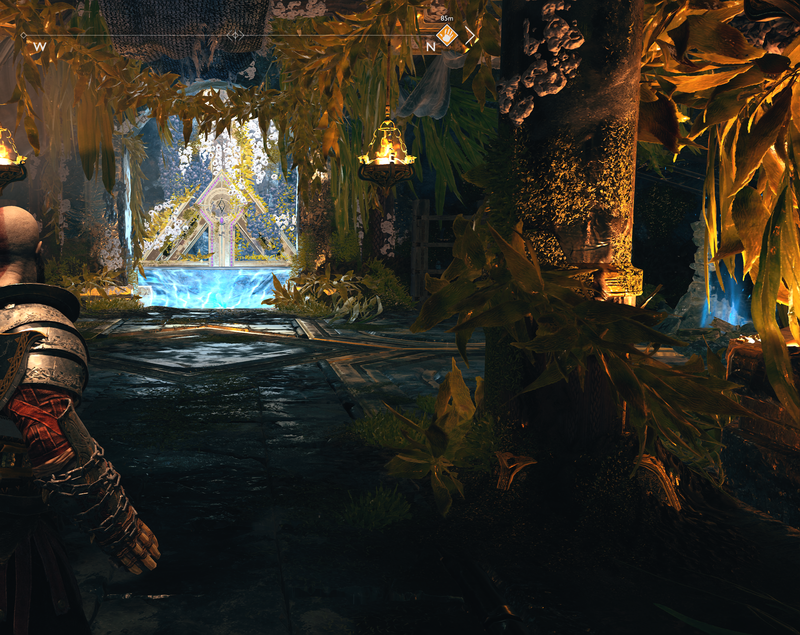 Here's where things get a little more complex: God of War has two options when it comes to performance on the PlayStation 4 Pro: Favor Resolution or Favor Performance. Favor Resolution prizes that 4K resolution and special effects, aiming for an average frame rate of 30 fps. Favor Performance unlocks the frame rate and allows the game to run higher than 30 fps, dropping the resolution down to 1080p to cut back on the horsepower required in certain scenes. It doesn't stay rock-solid at 60 fps, which is a shame, but it stays higher than the 30 fps floor. Honestly, Favor Performance doesn't look all that much worse overall on a 4K television. If you're a pixel counter, sure, you're not getting everything at the native resolution of your display. It's especially noticeable when it comes to the tiny details: Kratos' meticulously detailed beard, random foliage around the environment, a boatload of particle effects, and some of the insanely detailed textures, like the wood grain on some doors. But what you lose in resolution and detail, you gain in frame rate, which is a bit more important for things like combat. It's not a locked frame rate in either option, which is a shame, but I'd rather be above 30 fps than below. 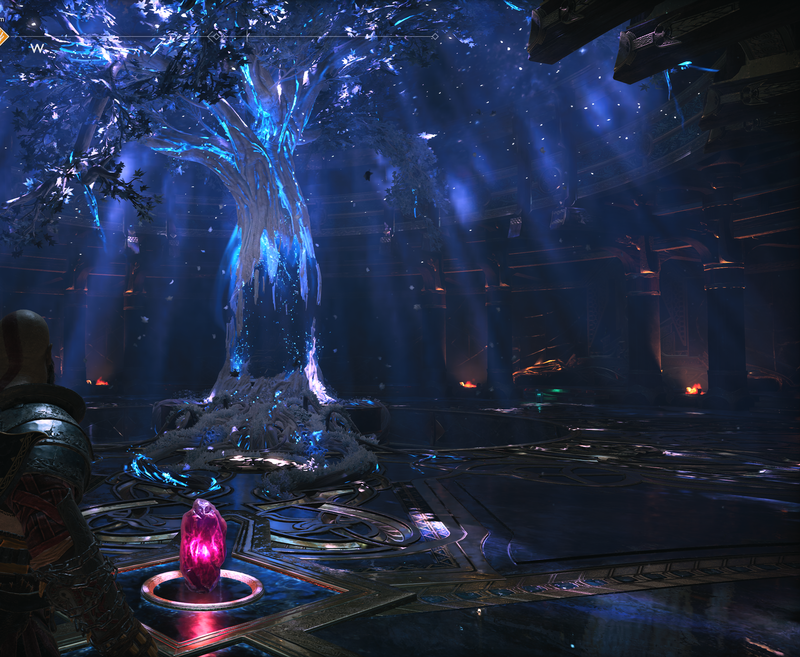 For one section of the game, God of War also seemingly lifts the snow deformation technology from Horizon Zero Dawn's downloadable content, The Frozen Wilds. It's only a single section of the game, but the tech is as impressive here as it was there. Random aside, but it was very cool to see it return. One facet of God of War's visual prowess is probably the hardest bit to talk about and relate to you, the reader. With the release of the PlayStation 4 Pro, Sony's studios have begun to support high dynamic range (HDR) color on many of their titles. It began with Uncharted 4, a game whose implementation wasn't as amazing as I would have expected. Horizon Zero Dawn was a winner in regards to its HDR, which made the lighting and color choices combine to make some absolutely beautiful scenes. God of War is similar the latter title, in that the HDR is astounding. It honestly feels like the levels themselves, notably a structure that forms the game's central hub area, were built specifically with HDR support in mind. Flickers of fire light up rooms of stone, metal, and ancient vines, the light playing off each material in a different way. In the next room over, an ethereal glow of various colors mix and match, bouncing off golden doors that have lost their lustre to age and weather. Volumetric lighting adds to the atmosphere, with Kratos treading across quiet areas that have been long forgotten to time and myth. The choices made in terms of colors, lighting, and materials—some diffuse and some reflective—add up to some grand vistas and screenshots. But I can't show you HDR. Your monitor likely doesn't support it, so trying to publish screenshots that show you the effect is a lost cause. Talking about high dynamic range color in games is a bit of a boondoggle, which is why I tend to avoid bringing it up. If you have it already, you're likely onboard the train, if you don't, it's hard to get across why it's worthwhile technology. But let me say that it looks damn good in the new God of War. If Sony Santa Monica could get a game looking this good up to a locked 60 fps, the future would be a bright one indeed. As it stands, the PlayStation 4 Pro tries its hardest and sounds a bit like a dying whale in the process. God of War is a stunning game, but even the Pro isn't strong enough to render everything the developer put in front of it without chugging. If there is a need for another generation of consoles-and fans are divided on that idea—games like God of War are sign posts showing us the way towards that future. Aim to run something like this at a stable frame rate. As it stands, God of War is the best visual showcase of the PlayStation 4 Pro to date and Sony's studios keep improving. I have to wonder if Spider-Man, Days Gone, Ghost of Tsushima, or The Last of Us Part 2 can stretch beyond what God of War is pulling off here, given the limitations of the Pro. Cause if Sony can improve on this, I'll be very impressed indeed. Tagged with Action Adventure,	Analyses,	PlayStation 4,	Sony Interactive Entertainment,	Sony Santa Monica. A fun story about the two directors meeting at E3.